Back in January, I wrote a rambling, terribly earnest post titled How Does a Child REALLY Learn to Write? That post generated a slew of thoughtful and heartfelt comments. It also managed to capture the attention of Wendy Priesnitz, editor of the always insightful Life Learning Magazine, who asked to reprint it. Since the original post was a bit off-the-cuff and, well, bloggy, I rewrote parts of it for publication. The first half, in fact, was completely reorganized into a list of what kids don’t need to write–a nice counterpoint, I thought, to the original conclusion of what kids do need. Since the article morphed so substantially from the blog post–and since Life Learning Magazine has moved on to its May/June edition–I though I’d share it here. Bonus points for those who answer the questions posed at the end. 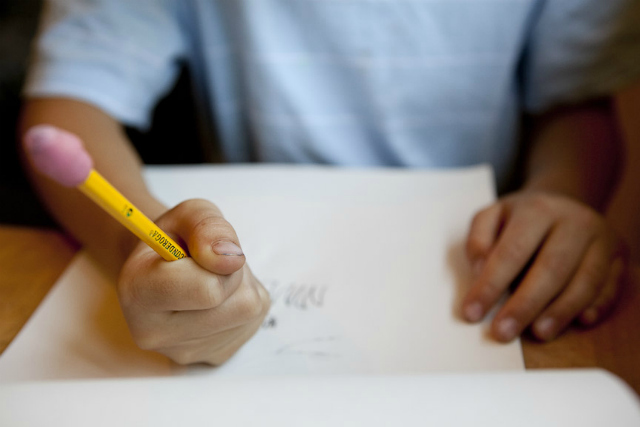 HOW DO KIDS REALLY LEARN TO WRITE? I have some radical notions about how kids can become writers. These notions didn’t come from my school experiences as a kid, or my years as an elementary school teacher. They came, instead, from fifteen years spent homeschooling with my own kids—now nineteen, sixteen and ten—and watching them become writers. They come from a dozen years of facilitating writer’s workshops for homeschoolers—a dozen years of word-tinkering with kids. They come from twenty years spent trying to make a writer of myself. Writing is an area that seems to prickle at the doubts of homeschooling parents—even the most radical unschoolers. How can kids learn a skill as complicated as writing if it isn’t forced upon them? Here’s what my kids and my experiences have taught me. Kids don’t need to master the mechanical skills of writing before developing voices as writers. So much “writing” time in school is spent learning the mechanics of writing: penmanship, spelling, punctuation, and grammar. Often, these skills are emphasized over developing written self-expression. The how of writing takes precedence over the what; words-on-paper skills matter more than what a child has to say. Schools push kids to write at six and seven because written communication helps teachers track the progress of twenty to thirty students. There’s no reason for a homeschooled child to take on these skills at such a young age. Learning to write is hard, perhaps one of the most challenging tasks a young person will undertake. When the power of a child’s motivation isn’t behind it, mastery of mechanical skills can seem like insurmountable acts of drudgery—which is why so many kids learn to dislike writing. On the other hand, if you focus first on what the child wants to express, the mechanical skills will fall into place over time. Kids needn’t actually transcribe to get their thoughts on paper and screen: they can dictate their ideas to a willing adult. This allows them to say more, express higher-level thoughts, and use richer vocabulary than they’d be likely to if required to write on their own. Young children tend to have lively, expressive, imaginative speaking voices; transcribing their words to the page or screen allows them to develop a vivid writing voice at a very young age. Meanwhile, their mechanical skills can develop more organically than they might in a classroom, as the child makes signs for lemonade stands, labels for rock collections, dialogue bubbles for comics, keep out signs for bedroom doors. Taking dictation is also helpful for older kids who are reluctant writers, or beginning a challenging project. Also, when kids struggle with physical writing, it can be helpful to introduce keyboarding as an alternative. Digital writing drives the world they’re growing up in, after all. Kids don’t need daily, or even weekly writing practice. The concept of learning through routine practice is mostly a school notion. Practicing small pieces of a larger skill day after day is a way of ensuring that a large group of children will eventually learn that same skill. The assumption is that the child will learn the multiplication table, or the rules of grammar, or the parts of the body if he or she works at them repeatedly. The teacher can’t be aware of learning that happens outside of the classroom, in daily life; all learning gets focused into a lesson format. Many of us who grew up in schools have unwittingly become convinced that a person needs this sort of routine practice in order to learn skills such as writing. But adult-driven, routine-practice learning rarely takes a child’s interest and motivation into account. In fact, in most cases, the child isn’t terribly engaged in this sort of practice. He or she does it simply because it is required. However, when a child’s interest and motivation are there, that child can often pick up concepts and skills rather quickly. Repeated practice isn’t necessary. Your daughter figures out how to multiply mentally because she wants to win at Yahtzee; your son understands how different ancient civilizations affected one another because he enjoys reading The Cartoon History of the Universe. The same goes for writing. Occasional, child-oriented forays into writing are rich, like a piece of good, dark chocolate: a little goes a long way. The signs your daughter letters for her make-believe candy shop, the Lego haikus your son writes for a contest: these are authentic, meaningful writing experiences and your kids learn deeply from them. They don’t need to be replicated on a daily or even weekly basis. The learning, because it has value for the child, accumulates gradually over time. In my years working with young homeschooled writers, I’ve seen this play out again and again. Kids who don’t practice writing formally or regularly still develop into unique, effective writers in their preteen and teen years—and often before. How does this happen? Read on. Kids don’t need to practice writing in various formats. Allowing kids to focus on topics and genres of interest will naturally help them develop unique, powerful writing voices. This, I’d argue, is the most essential writing skill of all. Kids don’t need to write to develop as writers. A most radical notion, I know, but I believe it! Here’s why: writing skills are based in thinking and speaking skills. If kids live in a home where people talk, discuss and debate–especially on topics important to the kids–those kids will learn to express themselves clearly and passionately. And this verbal expression will carry over into written expression when the time comes. Even kids who are not terribly verbal, but are quite logical, can naturally develop into strong writers if they understand that clear writing follows from logical thinking. In my years of facilitating workshops, I’ve seen a similar progression with many kids. If kids don’t need these writing experiences, why have we become so convinced that they do? If you hope your child will become an effective writer tomorrow, concentrate on making writing—and the broader skills of writing—a vital part of your child’s life today. So, how can you help kids develop into writers? Raise them in a literature-rich, word-loving home. Visit the library often and check out armloads. Read aloud and listen to audiobooks together. Encourage independent audiobook-listening if your child can’t yet read, or doesn’t enjoy reading. Have deep discussions about books and films–not based on someone else’s “comprehension questions,” but on your own wonderings. Tell stories. Read and recite poetry. Engage in word play: rhyming games, puns and riddles, Mad Libs, verbal poetry composed on the spot, and so on. Talk about what interests them. Let them go on and on about ballet or Roman legionaries or Smurfs if that’s what excites them. Ask questions. Let them explain in intricate detail. Debate them, gently, on fine details if they enjoy defending their beliefs. Ask for their take on important, real-world issues. This will develop their skills of explanation and argument, which will eventually factor into their writing. Make the distinction between getting-words-on-the-paper skills and written expression. In other words, remember that learning to form letters and spell words are not the same skills as developing a voice as a writer—the more important skill in the long run. 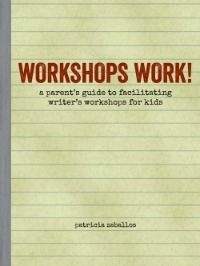 Help make the mechanics of writing as easy as possible for your child. Let those getting-words-on-the-paper skills develop slowly, ignoring public education’s timetable. In the meanwhile, explore dictation as a means of developing your child’s written expression. Encourage keyboarding as an alternative to writing by hand. Let them write about what interests them, and in genres that they enjoy. Rather than pushing dry reports and formulaic essay-writing assignments on your kids, search for well-written nonfiction books on their favorite topics. Unlike formula-bound essays, good nonfiction employs the tools of fiction; it absorbs us because it tells a story. Find history told with time-traveling comic characters, and science explained with zombies. Look for Shakespeare explored through silly top ten lists. Nowadays the children’s nonfiction section of the library bulges with such books—books which dare to capture a kid’s attention. They delve into content, as did the old report-ready nonfiction of our childhoods, while also modeling style, tone and even humor in writing. They’ll teach your kids how to move beyond the dull five-paragraph essay approach to nonfiction, and into writing that engages. Help them find meaningful, authentic reasons to write. Writing because Mom or Dad thinks it’s a good idea is not a meaningful, authentic reason! Generally, we write to communicate with others. We write to connect. (Unless, of course, we find fulfillment in personal writing such as journaling. If you have a journal-loving kid, value that! See Newkirk, above.) We write, very often, because we’re seeking a response. Find real writing opportunities that engage your child and invite response: letters and e-mails; family newsletters; blogs on personal interests; signs and props for make-believe play; displays of favorite collections to share with friends and family; rules for self-designed games. Make opportunities for your kids: host a writer’s workshop; organize a science or history fair; form clubs based on their interests: oceanography, insects, rock and roll music; help them gather a group to write a baseball newsletter; form a team and create a homeschooling yearbook. (All examples of actual activities organized by my local homeschool support group!) If you don’t have enough local possibilities, use the Internet: find websites of interest to your child with writing opportunities; set up group-written blogs or wikis; let your kids explore online forums if you think they’re ready for it; look for fan sites based on their passions; allow them to post reviews on music, books, films, videogames; explore the online writing community for young people at figment.com. This is a long list, yet it’s just a beginning. Your child’s own quirky interests will unearth other possibilities. To become writers, kids need something to say, the means to say it, and a reason to say it. Schools tend to focus on the means—the how-tos of writing. If you concentrate instead on what kids have to say, and helping them find real reasons to express that on paper and screen, the rest will fall into place over time. It really will. So tell, dear readers, have any points here played out in the lives of your own kids? Do any points make you curious? Doubtful? Nervous? Edited to add: Don’t miss page one of the comments! There are nearly 100 comments there, and so much helpful insight. I love this. Thank you for writing it. I have felt that fostering a love of storytelling is more important than getting my son to read and write at this age (he’s five). Although he can read a little, and sometimes he likes writing, I try not to pressure him, and in fact, I think it’s getting harder for him, and it’s making him want to take a break from those kinds of lessons. In my homeschool, I use oral storytelling liberally. I started telling my son stories at night, and he loves to listen to stories whenever I’m willing to tell. From this, he has wanted to make up stories of his own! We also do puppet shows, and my son has initiated doing some shows from stories we’ve heard (and we’ve made our own puppets! ), and we even turned one of his stories into a puppet show! It’s been so fun, and I truly believe that this love of his will naturally lead to writing and reading on his own. I think you’re absolutely right that storytelling can lead to writing and reading. Storytelling is just a different way to convey ideas in words. Avid young storytellers will probably want to have a written record of their words at some point, which is an authentic, motivating reason to write! And kids who listen to and tell stories learn so much about the rhythm of language and the sound of words, which is an important aspect of writing. Not to mention how storytelling teaches you to tell tales in an audience-captivating way. Thanks for sharing your experiences here! We don’t differentiate between writing and dictating here. At almost six my son has a stack of stories that have both of our hand writing mixed together. While he isn’t reading yet he enjoys the act of putting words on paper so when he’s really excited about that part of the writing he does it. Other times the story is too exciting for him to focus on the writing. When I was teaching reading with beginner readers I followed the philosophy that writing was a great way to learn how to read, especially for kids who didn’t like a lot of the subjects of the books out there. Often they had much more engaging ideas in their own minds. Now I still do this with my son but it isn’t a sit down directive it just meshes into our days. I love that notion of writing being a means of learning how to read. I agree. Every kid is different, and that’s an angle that can really work for some. I’m trying not to be over the top here but this might just be the best, most put together blog post on how to “teach” writing that I’ve ever read. (I love Brave writer stuff but that’s a book or course you purchase and your post is free!) I”m honestly not trying to flatter Patricia but I am just so thankful for people like you, who put these thoughts to “paper”. Because then in my coaching and writing I can point people here and say, read this. I think I’ve mentioned it before that I’ve been meaning to write an elementary homeschool writing post for ages. How we’ve done writing in our home. After a few false starts with spelling programs what you describe is how it’s actually happened. We write to communicate and our voice is so much more important than the means. Thank you for writing this, again, so well. Well, Renee, I would love it if you’d point people here and say, “Read this”! So glad that your kids have learned to write in this way. I know you have at least one eager journal writer in the family. That’s great! (My sixteen -year-old daughter told me that today was the fourth anniversary of her writing in her journal EVERY SINGLE DAY!) Whatever excites them, right? I need to print this article out and keep it where I can read it often for reassurance that I’m on the right track. Thank you so much, from the bottom of my heart. The key ingredients here for my reluctant writer: a forum he found engaging. An audience. And not coincidentally, a place where no one is taking off any points for misspelled words or weird punctuation–I mean, it’s a bunch of technology-obsessed young boys! Misspellings and weird punctuation are rampant in this forum, which I think made my son feel less afraid to go ahead and risk taking a guess about how to spell something. He also has used writing through dictation to speak up about something that bothered him. When the teachers banned some trampoline games he loved at his gymnastics class, he dictated a beautifully organized letter to me that acknowledged safety concerns but explained why he thought the games that had been banned should be allowed. Lo and behold, the games were reinstated. He had a purpose. I didn’t insist he write it himself. His words got results. My daughter, who’s six, does not write independently but dictates a journal about her day to me every single night. I take her words down just as she says them, and I know this is going to be a precious document to her some day. I’m guessing she will get interested in writing on her own when she no longer wants me to be privy to her every thought about her day. Yesterday she told me a long, wild story about the monster day care she has underneath our backyard maple tree. I so wanted to ask if I could grab a notebook and copy down what she was saying, but I decided that would be a rude interruption. So I just listened, trusting that all that oral storytelling has value even if it doesn’t always get written down. Your work has helped me relax and meet my kids where they’re at. It has been such a precious gift. Carrie, your comment is filled with so many examples of wonderful, kid-motivated writing! Thanks so much for sharing the specifics with other readers and me. This process will look different for every child, so it’s nice to see how it plays out for some. I’m glad my posts have been helpful to you. Your feedback here has always been a gift to me. Oh, you wonderful readers. There is so much good stuff to respond to here, and you know I love to respond to comments! But it’s midnight, and I have to be up early tomorrow for a weekend of living history with Mr. T, up in Gold Rush country. We’re heading to the diggins! In the meanwhile, as Linda Richman from Coffee Talk would say, talk amongst yourselves. I’ll be back at the end of the weekend to chat. I can see why the magazine would want to publish this – it’s brilliantly written and so true – thank you! I’m going to be sharing this everywhere. Oh goodie! I know you have a huge audience; that pleases me to no end. Thank you, Melissa! Hi Suki! You know, I’ve been going to the HSC conference for years, and I don’t think we’ve ever met, except maybe once in passing? If we’re both there next year, I will definitely look for you! Getting the school teacher out of your system is hard, isn’t it? Luckily for me, my kids have typically rebelled against any teaching I do, so they’ve mostly kept the teacher at bay! Thanks so much for the Facebook tip. I had no idea you could do that! I changed my address (apparently called a “username”) and fixed the links above. Thanks for the Facebook follow too! Suki, I went to the conference by myself for years and it was wonderful. Lots of time for listening and reflecting. But once I took my kids along, that was all over! Once they discover how fun it is, they don’t want to miss it! Oh well. It’s a great experience for everyone. I am not a homeschooler or a classroom teacher, but I do work with kids who struggle with reading and with handwriting. I advocate HARD for dictation as an accommodation for struggling kids — they don’t need to feel like a failure. This is such wonderful advice for all parents. Teachers in public schools (and to a lesser extent, private schools) are stuck having to meet state standards, but this kind of thinking is what can help change the standards. Liz, thank you so much for offering your perspective here. I agree that dictation can be a huge help for kids who struggle with reading and handwriting. It frustrates me that more educators don’t recognize that penmanship and writing are not the same thing. Kids with handwriting difficulties can absolutely blossom as writers when allowed to dictate. And once they do that for a while, they are often able to transition to keyboarding without too much difficulty. But you know all of this, I’m sure! Thank you! I love this post. I remember the endless classes of grammar. They seemed to never end. By High School I hated English so much I never did any of the work. I was terrified to write anything because the first thing that happened is you were judged not supported for expression. Thank you, thank you, thank you for putting it into words for me! It is now in my awareness, so I know what to not do and do with my daughter. When I hear that kids hate English class, it makes me so sad. English class should be a joy! It should be about reading great literature, responding to it in a meaningful way, and learning to express oneself as a writer. Instead, it often gets treated as a forum for learning grammar and vocabulary out of context, and for dry literary analysis in archaic formats like the five-paragraph essay. Have fun with books and words with your daughter, and follow her interests. You can’t go wrong with that! We homeschool and I would love to be able to let my children learn writing naturally and at their pace, however our state requires standardized testing. So I have to push my children to learn the grammar and such when I would rather just let them write and have fun. I am caught between wanting to foster that love of the written language and meeting the benchmarks for my state. Your perspective on “teaching” kids to write is one I hold as well. I think children should be allowed to learn at their own pace and in their own methods. Learning is only learning if they are engaged in the activity. Obviously there are things that they will have to learn just for the sake of meeting standards, but as a whole I want them to learn because learning is fun! And I want them to be able to express themselves well. This article was simultaneously encouraging and challenging! 🙂 Thank you for sharing your wise thoughts! You know, Jennifer, I’ve found that when kids explore reading and writing as I’ve laid out in my article, they tend to do fairly well with reading and writing on standardized tests. Grammar, I believe, is best learned in the context of one’s own writing. When it’s taught out of context, kids tend to forget what they’ve “learned”. On the other hand, when kids find writing formats that matter to them, and real audiences for that writing, they begin to care about their writing. They often become very intrigued with grammar, as it becomes a tool to help them express themselves just as they want to. And if you feel that you have to “teach” rules, having your kids look for examples in their own writing, and in their favorite books can be a great way to go. My three kids have all grown up learning in the ways I mention in the article. I never “taught” spelling, grammar or vocabulary to them–we just approached it as it came up in what they were doing. All three have taken standardized tests at times over the years, for different reasons, and all three have excelled in the reading and writing sections. Of course, every child is different, but I believe that if you foster a love of reading and writing, the kids’ internal motivation to learn will propel them further than you anticipated. They often end up surpassing school kids simply because they enjoy reading and writing, while many school kids have that enjoyment beaten out of them over time. Is there a penalty if your kids don’t do well on standardized tests? Can you ignore the results for a while? My experience is that while homeschooled kids who learn reading and writing in this way may have lower test scores initially, because they aren’t being pushed, their scores end up surpassing school kids later, when their own internal motivation towards reading and writing become the driving force. You wrote, “This article was simultaneously encouraging and challenging!” Thank you. That’s the best kind of compliment you could give me. I just found your blog yesterday and I am looking forward to reading more of your posts! Thanks for reassuring me that a more natural learning process is truly worthwhile. Keep at it, Paula! And if you’re on Facebook, check out those comments on this post, on my page, from experienced homeschoolers. http://www.facebook.com/pages/Patricia-Zaballos/202665096470053?sk=wall&filter=1 These ideas really work in the long run. I think you really got to the crux of the matter in your response to Paula: “These ideas really work in the long run.” Are we looking for temporary but “correct” results now or are we willing to wait and trust the process (as well as our child’s ability to learn) and reap the results in the future? So many times, especially in education, we are pressured into just learning for the test. I prefer learning for the love of learning, as that is knowledge that becomes a part of you not just something you regurgitate for a test and forget later. I think much of what you say here makes great sense, and it is important to have this perspective articulated. I also have some mixed feelings…. This past year we homeschooled our 14-year-old son (8th grade). It was a good choice for our family, and we plan to continue through high school. Our son loves to read and is an excellent writer (therefore?!) but his processing speed and executive functioning skills are underdeveloped, so writing took him a lot longer than his peers in 7th grade. He was frustrated by school, so we opted out. This year he participated in National Novel Writing Month and created a rough draft of a complete novella (33,000+ words) in the month of November, using Dragon (dictation program). It was an empowering accomplishment “writing a novel” and one that has helped him to see that just putting words on the screen and not worrying so much about editing is a great way to write a first draft. His writing continues to improve, and his “assignments” have been self-created for the most part and real-world service-learning based. So that’s all good. I am also an English professor at a University, and the students in my writing classes (whether they were homeschooled or attended public schools makes no difference), one of the biggest problems the students face is that they do not know the difference between oral and written expression. They write like they speak, and one semester of Freshman Composition does not fix the problem. They often use writer-based prose instead of reader-based (i.e., they do not know how to write for an audience to meet their needs, writing merely from their own limited viewpoint). They almost uniformly have no real grasp of the basic conventions of grammar and punctuation, and no matter how wonderful their ideas, if they can’t convey them in the appropriate format for the intended audience, the writing is not effective. Unlike some professors, I do cover these fundamentals in class (a choice which means I have to sacrifice content or higher order analysis). Most professors just mark the papers with a low grade. While I do think finding a “voice” is important (and I get sick of reading the same canned, ultra-safe, trite expressions from students with no voice), to be successful in college and in careers that include writing of any kind, students must, I’m afraid, have an excellent ability to follow sentence level and mode/genre conventions. How to help our children and youth to acquire those skills is the question. I agree that asking kids to do grammar workbooks does not help retention. I do think that a lot of practice is needed, however, so I am uncomfortable with the idea that youth will pick up the grammar and mode conventions if they begin very late in the game. I think it is very important to begin with key conventions at least by middle school. But, yes, integrating this practice into the child’s own production of writing is key. I have taught my son for years about punctuation rules, but always through his own mistakes–not a grammar handbook. Now, I can look at something he’s written and make check marks in the margin on a line where there is a mistake and ask him to find his own mistake on that line. Half the time, he can pick it out and correct it, and the other half we must go back over the rule. I also teach the rules by drawing them and creating metaphors. A period is a divorce, a semi-colon is separate bedrooms! Commas on both sides of interrupters are like ( ), and I hold up both of my hands and cup them around my mouth to show it. I use this technique with my college students, too, and it helps, but by the time they get to college, they have so much on their plate, it is almost too late for them to learn conventions. They have to be able to crank out the work too quickly. I hope this is helpful. I want to emphasize that I agree with most of what you are saying. I just think there’s a potential danger here, as well, if we wait too long to get started helping our children to make the transition from oral to written expression. There is a difference, and if habits of writing in an oral way become ingrained, it can be hard to learn how to write in a new way. Perhaps, I would just emphasize writing for a real audience as much as possible. This way, we can help our kids understand that if a letter of complaint to a restaurant that uses styrofoam cups, say, contains multiple sentence-level errors or does not address the reader’s needs/concerns/perspectives, then the letter will not do its job. Diana, I appreciate having your perspective here. Please note that I’m not advocating delayed literacy. I’m advocating literature-rich homes in which kids are exposed to words and language constantly. When I write about dictation, I don’t simply mean recorded oral language. As you’ll see at the end of my piece, I encourage parents to find real audiences for their kids’ writing, whether that writing is transcribed by the adult or the child. Those audiences are what will teach kids to “follow sentence level and mode/genre conventions” as you so succinctly phrase it. You write, “Perhaps, I would just emphasize writing for a real audience as much as possible.” Absolutely! The sooner kids find audiences to write for–whether that be for a radio program, or for fellow kids in a writer’s workshop, or for an online video game review site–the sooner they will begin to recognize that different writing conventions are required in different settings. That’s essential, I agree. I’m guessing that the kids who struggle with writing in your English classes did not grow up in households that valued the methods I’m promoting here. Most are probably products of traditional school writing programs. (Even the homeschoolers in your classes may be products of traditional programs, as many homeschoolers take a formal approach to the teaching of writing.) As you can see in your classes, the traditional school approach is not creating kids who can write! I’ve researched fairly extensively what’s happening with writing in schools, and for the most part it’s a mess, due to the current climate of testing and standardization. Teachers who believe in progressive methods, more like the ones I’m writing about here, have to fight to teach this way. The most exciting work in writing education, in my opinion, is being carried out by educator/writers like Troy Hicks, Jeffrey Wilhelm, Kelly Gallagher and Barry Lane, educators who advocate teaching kids to write by letting them engage in “real” writing, like blogs, wikis and other forums, based on their own interests and ideas. Those educators have much evidence that their methods are effective. I think they can be effective in a home environment as well. I love all of your examples of metaphors for punctuation! I’ve noticed that kids who enjoy writing learn to appreciate punctuation, and like these sort of mnemonics. Many are eager for it at suprisingly young ages. As you wrote, I think we’re mostly in agreement here, Diana. Perhaps my article conveyed the notion that I don’t believe in having kids delve into “real” writing when they’re young. On the contrary: I think it’s a parents’ job to watch the child’s cues, and to help make writing something valuable and meaningful to the child. Kids who participate in the sort of activities I write about in the last section of my article, on a fairly regular basis, should be able to take on college-level English when the time comes, if they decide to. As Thomas Newkirk writes in the quote I used in the article: “The good writers I see in college have often developed their skill in self-sponsored writing projects like journals or epic, book-length adventure stories they wrote on their own.” I believe that too. One other thing: you write, “Please note that I’m not advocating delayed literacy.” What does that mean to you, exactly? In our society it means not holding to the school’s schedule, that is, beginning instruction at the latest by age 6. By that definition I *would* advocate “delayed” literacy, for those who are not developmentally ready. There is a lot of talk about the epidemic of illiteracy, and the notion that it is due to not enough instruction. In line with your article here, I argue that for many children it is too *much*, as well as too early, resulting in the label of “learning disabled” which is internalized, becoming a self-fulfilled prophecy. Writing instruction might be valuable for those who don’t have a writer’s brain to begin with, in the same way that it is useful for those with Asperger’s Syndrome to be able to learn, remember, and consciously apply the rules of human interaction that the neuro-typical intuitively and automatically use. Those people aren’t going to be novelists, though. It’s important to keep in mind that not everyone needs to or should be a writer. I’ll argue that most of the kids who struggle in your classes simply don’t have writer brains, and that they’re there only because they think they’re supposed to be there. Those who do have writer brains don’t need more mechanical instruction, they need more opportunity to experience logic, intelligent discussion, and artistry, and the way those can take shape in writing (a dearth of which is found in the average high school and family life.) In other words, they need to interact with smart people and they need to read, a lot. Given these opportunities, the writer brain will take care of itself. No assignments necessary. I appreciate this eloquent response, Linda. I love your line about students needing “more opportunity to experience logic, intelligent discussion, and artistry…” Lovely and so true. While everyone isn’t going to be a novelist, I’d argue (and I’m guessing that you’d agree with me on this) that everyone should be able to express their thoughts clearly on paper. Yet the majority of adults have doubts and fears about their writing. I’d say that this isn’t because they didn’t receive enough writing instruction; rather it’s because they received too much instruction based on rules and formulas and with too many corrections in red pen, and not enough practice writing on topics that were meaningful to them. Over-correction simply gives students hang-ups and they begin to doubt their abilities to express themselves. Plentiful practice writing on meaningful topics helps kids sort out their issues naturally. This is what I believe too. Thank you for taking the time to comment, Linda! Thanks for asking for the clarification, Linda. When I wrote, ” Please note that I’m not advocating delayed literacy,” I chose my words poorly. What I really meant to say is that I’m not advocating an early childhood devoid of literature and words. In other words, even if kids aren’t reading and writing themselves, their lives can still be rich with literature, if families engage in the sort of activities I wrote about in the section above labeled Raise them in a literature-rich, word-loving home. I absolutely believe that kids shouldn’t be forced to read and write before they’re ready. I think schools push those activities on kids before they ought to. Kids should be able to learn to read and write when they’re developmentally ready, and based on their own cues. In the meanwhile, we should be helping kids engage with books and language in ways that are appropriate and interesting to them. I think everything I’ve written on my blog supports those notions. Thanks for helping me see that my word choice in this case may have misrepresented my beliefs! I can share my own experience learning to write. For sure, I did not learn how to write in school. My writing was tedious and boring. If anything, my strengths were in math and to write, I had to unlearn my school day lessons. One day, on impulse, I decided to write a novel. I spent the next four months putting 80,000 words on paper. I sent my work out to literary agents where it was, understandably, rejected. As it is, my wife has a friend who is a copy editor so, as a favor, she copy edited my work. That one round of copyediting my own, spontaneous work taught me more about writing than I ever learned in school. Since then, I found a publisher for my literary novel, Peter Squared, and went on to write a second work of non-fiction, The Homework Trap: How to Save the Sanity of Parents, Students and Teachers. Reading this list of recommendations, I’m not sure how they would have worked for me as a child. But I am sure that the standard approach did not help at all. http://www.thehomeworktrap.com. Kenneth, I’ll bet that most writers would say that they did not learn to write in school–unless they had progressive writing programs in their elementary or high schools, or they learned in a college creative writing program. As you say, many of us have to unlearn what we learned about writing in school! That was precisely my experience. Practically all I know about writing, I’ve learned as a self-directed adult. I’d like kids’ writing experiences to be more like what you’ve done as an adult learning to write. I’d like them to decide to write because they want to, on topics that interest them. I’d like them to work at it because it matters to them. I’d like them to come across mentors who help with what they need, so their learning is useful and meaningful. And I’d like them to, eventually, write work they’re proud of. That worked for you, it worked for me, and I think it can work for kids as well. O.K. I see your points but how does this play out in the real world. I’m not a homeschooler. Many of us aren’t, for reasons as varied as the reasons people homeschool. So how do your practices work in the school environment? Because I wrote this article for a homeschooling publication, I wrote it directly for homeschoolers. Usually on this blog, I try to address both homeschooling parents and parents of kids who go to school. I have many readers who aren’t homeschoolers, and I don’t want to exclude them. Typically, what I’m writing about can apply to them as well, at least to some degree. Many of the ideas I write about at the end of the article can be used with kids who go to school: creating a literature-rich, word-loving home; talking to kids about what matters to them; exposing them to interesting nonfiction; helping them find meaningful audiences for writing outside of school. Your child may not have the privilege of writing on topics of choice, but when school writing assignments are given, if there’s an angle that might be more meaningful for your child, it’s worth pursuing the possibility. Likewise, your child may not be able to dictate all of his or her assignments, but if dictation might help a child complete homework, you might discuss the possibility with the child’s teacher. Even if the teacher refuses, when the child is working on a longer paper or report, you could take dictation initially, so the child can focus on meaning, and then have the child copy the work. Then there’s that last idea: helping kids find meaningful audiences for their writing. Many school kids find themselves writing at home, on the side, in areas of interest like the ones I mention. As I wrote: “…find websites of interest to your child with writing opportunities; set up group-written blogs or wikis; let your kids explore online forums if you think they’re ready for it; look for fan sites based on their passions; allow them to post reviews on music, books, films, videogames; explore the online writing community for young people at figment.com.” Writing for these audiences of interest is probably the very best way for a child to develop as a writer. Parents shouldn’t assume that kids are learning to write well in school. Unfortunately, as I pointed out in my comment to Diana, above, writing education is in a tough place right now, due to the current culture of testing and standardization. Current policy makes it difficult for teachers to teach writing in a meaningful way–though there are plenty who still manage it, as the National Writing Project and its many teacher-researchers will assure you! Still, meaningful writing instruction these days is the exception rather than the rule, so parents would be wise to play a part in their kids’ writing education as much as they can. You asked how these ideas might work in a school environment, and I suppose I’ve answered how they might work at home instead. There are educators who are using ideas quite similar to what I’m proposing here. I mentioned a few in my response to Diana. There are many, if you look. Also, the National Writing Project, mentioned above, trains teachers how to teach writing in a child-centered way. I’m a homeschooler but also have a son just finishing his 6th grade year in public school. When he was homeschooled, we did not write much because the fine motor issues were difficult for him as he has high functioning autism. Since going to school we still manage to provide him the support as a writer (noted in the article) as he is a now prolific writer and reader at home. The writing and reading he does because he enjoys it will certainly pay off in the long run. His writing is school does not reflect his skills because he is often not interested. What really got him interested in writing was his interest in finding out about the authors of the books he was reading. I have also managed to take him to 3 book signings which was incredible for him (Cynthia Lord, Rick Riordan, and J and P Voekel). He took this interest in spite of so. Sorry, this is hard on a kindle. Anyway, even with so so grades in school writing and fine motor issues, he has started 6 novels and a screenplay since he got his laptop at Christmas. He loves to write! I’m so glad you’ve been able to support your son’s writing at home. Your response is quite telling: his writing at school doesn’t reflect his skills because he isn’t interested, he gets “so-so” grades in school writing–yet he’s started six novels and a screenplay since December! I’m convinced that those self-directed experiences will be what makes a writer of him, just as they do for others who discover a love of writing. If he loves to write, he just needs to keep going. Fantastic. As a grown unschooler and writer, so much of what you say in this article resonates with how my family approached things, and how I learned to write! I especially appreciate that you emphasize that the mechanics of writing are relatively unimportant, and will come with time. Developing a “unique writing voice” is definitely much more important (and more fun)! Thank you for sharing your thoughts and experiences, I’m sure they’ll prove helpful to many parents! Hi Idzie! 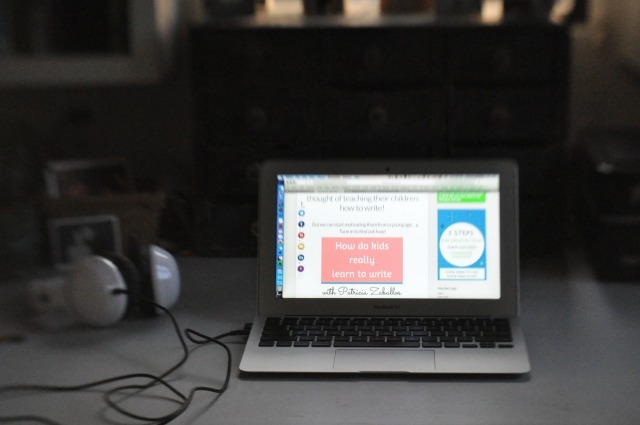 I feel like a homeschooling rock star just showed up on my blog! I’ve read your story of becoming a writer on your blog and elsewhere, and it’s so exciting. I’m glad to hear that you agree that the mechanics will come in time–I’ve already had a college English professor express concern that I’m belittling the importance of learning mechanics. My experience, though, is that if parents help kids find writing forums that interest them, the kids will learn the mechanics out of necessity–and because they actually want to. Thanks so much for taking the time to say hello! Thank you for this excellent post! As I was reading, I found myself nodding in agreement with point after point, because they are exactly what I see with my daughter, age 8. We unschool — but I am also a university instructor, teaching future teachers, and I intend to share this article with them. Many of my students write lesson or unit plans that end with the inevitable essay as the only vehicle through which the students may share their learning….and every time I see that, I cringe. Don’t get me wrong — I love writing; heck, I even love essays (I was an English teacher for years! ), but I know that, for many kids, much of the learning that they just experienced in the lesson or unit will be lost in translation if they have to write an essay about it — *unless,* as you mentioned and as one of your commenters advocates, they are allowed to dictate (or draw! act! speak! sing! model!) their thoughts…. Again, thank you! Hi Annette! It’s always great to get feedback from folks who are both homeschoolers and instructors at the university level; it’s very validating to envision you nodding in agreement! That you plan to share this article with your students thrills me. I wonder if you’ve come across the book 51 Wacky We-Search Reports by Barry Lane. http://www.discover-writing.com/store/section-teaching-non-fiction.html It’s a fantastic resource for helping kids discover compelling, fun ways to write non-fiction reports on whatever they might be studying. What’s especially neat about it is it’s written directly for kids, so they can find report types that are uniquely appealing to them! I remember reading in Barry’s book But How Do You Teach Writing that when a college professor assigned a wacky we-search paper to her graduate students, not only did the assignment fulfill many state standards, but many students reported that it had been “the most engaging assignment they had done in six years of college.” Might be a resource for inspiring your students beyond the dry essay assignment. THANK you for this book recommendation!! I think a “we-search” paper might be just the ticket for a course I’m teaching this summer! Wow! I really loved this post. Here’s why. I grew up going to school, as did most home/unschooling parents today. My high school was a small private college prep school and we did a lot of writing. You know what I learned? That I hated writing. Or so I thought. Then, several years ago, I started blogging. I haven’t blogged in over a year, having too much fun on Facebook now, but what I found while blogging is that I LOVED writing. I was 40 at the time. School helped to completely convince me that I hated writing. How incredibly tragic. They stifled my written voice and it took me decades to find it. So, what did I do with my kids? Well, I unschooled them. But like a lot of wives out there, my husband wasn’t always as supportive of unschooling. He has trust issues (and after all the years he spent in school, no wonder he did). So, every once in awhile he would have me do something ‘schoolish’ with the kids. You know, just to be sure they were learning. One of the most painful memories of this ‘schoolishness’ was when our firstborn, then about 9 (he is now 22), came to show me a book he had been writing and illustrating. It was awesome, I did tell him that. It was 40+ pages in a spiral notebook. He’d really been working hard on it. But of course the spelling and punctuation weren’t great. So, per my husband’s suggestion, I proofread a page or two. My son was crestfallen. He didn’t want me to be a teacher and do that. He wanted me to be a reader, enjoy his story and discuss it with me. I remeber how hurt he looked when I made marks on his writing. He never showed me anything he ever wrote again, and he didn’t write for a long time. It still hurts me when I write this. Of course, I apologized and asked him to forgive me for being a ‘teacher’ instead of a ‘reader’, and he did. But, the damage was done, for quite a bit of time. By overlooking is wonderful storynto point out misspelled words, I devalued my son’s burgeoning written voice. Years later, my daughter, at around 8, wanted to write. But she wasn’t reading. Again, my husband kept saying, “We need to teach her to read so she can do all this writing she talks about.” (It might also be helpful to mention that my husband’s father was a Lt. Col in the Marines, so following the proper order of operations was drummed into him at an early age.) I didn’t force our daughter to learn to read. I let her dictate her stories to me. I saved them as documents so we could go and add stuff to the stories as she thought about them. Interestingly, she never finished any. I never said anything to her about spelling and punctuation. I didn’t have to, the Pages app on my Mac did that. I would print out whatever we worked on and give it to her. She may have practiced her reading that way. I totally believe that she learned to read by writing…her writing. Now, our daughter is 12. She has never been given a fear of writing. I have never proofread anything she has typed or manually written. She has never had a spelling lesson, but she is getting so much better at spelling. I believe that has to do with the wonderfully non judgemental ‘spell check’. She loves reading too. but she didn’t learn to read until she was 10. In 2 years time she went from Cat in the Hat to Hunger Games. (Reading was something else school made me hate, which I didn’t discover a love for until I was in my 20’s.) My daughter loves reading fan ficton and writing her own based on stories like the Harry Potter series, Percy Jackson series, etc. She loves audiobooks too. My husband, daughter, and I all listened to the Hunger Games on audiobook, then saw the movie. It was great. I learned from the mistake I made with her brother and have always honored her written voice. My son did write again. He writes songs. He is a drummer (sometime guitarist) and singer for a post rock band (so the singing is more like adding another layer of sound, than singing as many would define it). I fully support his music. I have read some of his lyrics, as I really can’t tell what he is saying when he sings them. They are beautiful poems of really heartfelt stuff, ranging the full emotional gamut from love to anger to pain. Some are about finding yourself, some about lost love. Some are just great words put together in a really cool way. I’m glad he found his voice again. I will never take it away. Which was not the effect I was going for. Luckily for us, I started up a writer’s workshop for kids in our homeschooling group not long after, and that absolutely regenerated his love of writing. Phew. Like you, too, that experience taught me what not to do with my daughter (and later my second son.) I took dictation from her for years, and basically helped her in any way I could so that she would never come to hate writing. She’s always been an avid writer. I’m so glad that your son found an outlet for his writing. And I hope you aren’t too hard on yourself for your earlier experiences with him and writing. You can’t become a better parent without making mistakes! You have such insight into your kids and their strengths; I’m sure they must sense that. So great that you found your love of writing via blogging. That’s what my next post will be about: how parents need to find their own love of writing if they want to inspire their kids to write! Thank you for sharing your story, Rachel. We can all learn from it! Absolutely inspiring and meaningful article! Thank you so much for sharing from your experience. This is ging to be so useful for homeschooling moms like me with young kids. My daughter is just 6.5 now but as you know she’s always had a friendship with the written word. Even when she didn’t know the letters, let alone how to form words, she would scribble on paper for hours. She’s being home-schooled for the past one year and never once have we bothered about spellings, commas and stuff. She writes with real-world context. As in- some days she wants to write letters; other days she writes about her adventure play with her friends. Couple of days back, we went to see Madagascar 3. At 11 PM at night we both got into a passionate discussion about which one was our fav character. In the middle of the discussion, she ran to get her ‘night-time’ diary so she could write a ‘review’ about the movie to share with her friends! Now, she wants to start her own blog. So interesting to hear how even an eager writer like your daughter didn’t enjoy writing when it was imposed on her via school homework. For a lot of kids, that’s their only writing experience. She’s so lucky that she learned to love writing before she ever got to school–and now she’s able to write on her own terms. Quite a party going on here with so many interesting conversations and trackbacks. Congratulations. It demonstrates you’re really on to something and I think it has something to do with your angel I mean angle. Oh you already know how much I agree with every single thing you’ve stated, and so what I’d like to comment on is your style and writing structure because that’s what appeals to me about this post. Primarily, I liked your tone. It comes across as believable and it conveys your expertise about the subject. It sounds convincing, slightly defensive, but with justifiable reasons conveyed concisely. Secondarily, I like how you began with what kids don’t need to do to become a good writer and then moved to what they do need. It works very well to do it that way, in my mind, because with the heavy emphasis in schools upon the structure or format of a piece vs. the content and writing style of it, it seems to work to elaborate upon what isn’t working re: that approach. It gets the reader straight to the center of the dart board, the central problems with the way writing is being taught to children these days, in addition to, our culture’s misconception about what the emphasis should be when teaching writing. It’s ironic that I’m criticizing the emphasis upon structure and commending yours–but realize that’s because the style is already there. Next to content, developing a writing style is critical, above penmanship, spelling and grammar and format, at least that is what I believe. Those other elements can easily be improved upon, but you can’t teach style. Style comes from a person being free to write and free to develop it. Anyway, I hope you shape your E-book in a similar style and format. Thanks for the kind words, Kristin! I totally agree with you on the notion that developing a personal style is essential in writing. It’s the part of writing that so many kids come out of school without, because they’ve never been allowed or encouraged to write about what matters to them–and that’s really where you learn to develop a personal style. Structure in writing is essential too, but it makes more sense to study style as you’re learning to write, rather than having structure dictate how you write. One of the best ways to learn structure is to have kids study writing they admire, and to analyze how the writer has structured the work. That’s what you’ve done with my piece here. I’m honored! I asked my two oldest sons ages 13 and 10 to pick topics they wanted to write about. I have had them freewrite several times and they still have very minimal amounts written. I guess I assumed they would get excited about the topics they chose and end up with a page or more. Do I just keep trying in this manner with other topics they choose? Or should I switch to daily journaling? Or are some children, particularly boys, just not able to write more than two or three paragraphs on a particular subject until they are older? Motivating kids to write is complicated, isn’t it, Gina? Allowing them to write on topics of interest is definitely a step in the right direction. But even then, freewriting about something because your mom has asked you to may simply not be that exciting to a kid, regardless of the subject matter. In addition to allowing kids to write on topics of choice, the other important factor in encouraging writing is the final point I made in my article above: Help them find meaningful, authentic reasons to write. I gave many examples of what I mean by this in the article. Finding these audiences is probably the biggest challenge for a parent who wants to foster writing–but it’s worth the trouble, because once the kids are motivated to write, the rest will fall into place. Don’t feel rushed to find those audiences, but start thinking about it, and consider what might work for your boys. 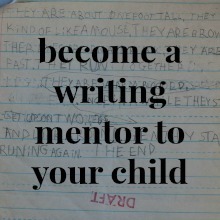 Since you have two kids who are fairly close in age, and are both able to write, you might try writing together. (That means you write too!) Rip the Page, by Karen Benke, is a fun book full of simple writing explorations. Your boys might enjoy taking turns choosing prompts from the book. Then everyone can write at the same time, and share what you’ve written. http://karenbenke.com Another book with fun writing ideas, but based on nonfiction topics, is 51 Wacky We-Search Reports, by Barry Lane. http://www.discover-writing.com/store/section-teaching-non-fiction.html You could use these ideas with those preferred topics of your boys. Bonus: both books are written directly for kids. Learning to write this way takes investment on the part of the parent. But try not to get over-worried, and try not to push things. Do some of the other things I mention in the article above, and start thinking about how you might find those motivating audiences for your kids’ writing. Thank you for this amazing post. I have read dozens of books, taken ds 11, recently diagnosed with dysgraphia, to multiple people in hopes that they would find something to explain his absolute abhorrence of writing. As a last result we went to an OT and LO and behold! Now I view the hundreds o lists he makes of fish taxonomy and other science ideas as real writing! He also posts dozens of sentences a day on a school related social forum, in addition to typing responses for online classes. Your insightful words helped me view these as valid writing, not just bits and pieces. I feel an enormous sense of relief! It sounds like your son is doing a lot of writing, Sarah. I’m so glad that you recognize that! My 12 yr old daughter will tell you she is NOT a writer! However, she is constantly writing stories and books on our computer. I have read two of these books so far and have been amazed! Her conversational tone is wonderful. She truly does write the way she thinks and speaks. We are radical unschoolers. I facilitate the learning in our family as it unfolds naturally. My daughter has been a story teller her whole life. Her imagination is bigger than life! Now she chooses to put these stories in print because she wants to. I am constantly amazed by what she will do when she is motivated to do something. Nancy, it’s always great to hear from unschoolers who share how their kids found their way into writing. I think that kids who are not “taught” to write tend to have more natural writing voices–when they eventually write–than many who have been taught. So much writing instruction gets in the way of what kids intuitively understand about writing, which they learn from reading and speaking. At least that’s what I’ve noticed! Thank you so much for sharing your wisdom for everyone. My partner and I have 5 children between us, and while none of them is/will be homeschooled/unschooled etc, I really appreciate that you have made this article and your replies available so that the schooled kids can have some of the benefits of your experiences too. I grew up in a home where literature was important, we went to the library every week, we bought books and I devoured books, and was lucky enough to LOVE English at school, although interestingly I DETESTED my English Literature classes! I hope I can share some of my passion for reading with our children and that we do manage to maintain some interesting conversation in our home, although 🙂 right now we have one and nearly two teenagers who routinely answer all questions, statements, respond to jokes etc with “Whaaaaaaaaaaat?” 🙂 The challenge is to draw them into conversations that they enjoy, and get them thinking. You know, many of my readers have kids who go to school. I think much of what I write about can apply to those families as well as homeschoolers. Because, really, I believe that kids develop as writers based on the accumulation of a lot of very simple things: being raised in a home where people love books, where people talk to each other, where people talk about books and play with language together. I know how it can be with teenagers. They don’t always want to talk, do they? It’s all about catching them at the right moment. Thanks so much for reading, and for saying hello! I’m glad that the post was helpful, Leeann. You’re lucky if your five-year-old is developing both mechanical and creative writing skills naturally. That’s how it ought to work! Sounds like you should stop doubting and just keep doing what you’re doing. Keep encouraging and playing! I love to hear stories like this, Marian. Thank you for sharing it. Any kid who is internally motivated to go back and expand his or her writing is most certainly a writer! Thanks for your great article. Do you have any compelling non-fiction book recommendations for say 9,10 and up? 3 – 5 would be great! Funny you should ask–one of my blog goals is to compile a page of intriguing nonfiction for kids. My thought is that once I get it going, readers can leave their recommendations in the comments, and we can get a grand list going! I am just such a believer in the importance of engaging nonfiction for kids. It’s tricky to make recommendations without knowing a particular child’s interests–because I think the kid’s interests should be the starting place. But I’ll just throw out a few that have been favorites around here. The Elements by Theodore Grey. http://www.theodoregray.com/PeriodicTable/Posters/index.theelements.html Makes a topic that might seem dry, fascinating. A good one to have lying around for kids to read in bits. A beautiful book with gorgeous photographs. Basher books: http://basherbooks.com/usa/home.html A whole series of books on different topics. (Not limited to science, actually, but my kid loves the science books.) Takes different topics, such as astronomy, rocks and minerals, and biology, and explains them by making concepts into cartoon characters. Fun, and a neat writing model that kids might enjoying mimicking. Horrible Histories, by Terry Deary. http://horrible-histories.co.uk/books/ Series of books that focus on the dark side of history, written in a humorous style. Poop Happened! A History of the World from the Bottom Up by Sarah Albee. http://www.indiebound.org/book/9780802720771 Yep, it’s about what you think it is. And it’s funny and fascinating. Lost States by Michael Trinklein. http://loststates.blogspot.com Stories of states that never quite made it into the U.S. Compelling stories that you’ve never heard before. My 11-year-old loves it. Just a few to get you going! This is a wonderful piece. After working with young children and teachers of young children for 40+ years, I have stories to support all that you’ve said. I will share one–I visited a 2nd grade classroom to introduce Vivian Paley’s Storytelling/Story Acting. The children were lined up to dictate their stories to me, excited, eager, and brimming over with ideas. Other children sat at their desks and wrote their stories. Of course we acted them out together later (the bonus of acting out is what motivates many of them to tell a story). As I was leaving, the teacher said, “I can’t understand it. They struggle with writing in their journals. They never have any ideas. Some of them NEVER write.” Here’s the key: kids want to tell stories, they want to communicate, they want to share their ideas, dreams, fears and humor. And the physical, acting out simply extends and enriches the experience. In fact, young children do not understand their ideas until they can SEE them acted out in front of them. Thanks for this post. I will share it often. Judi, my oldest went to a co-op preschool for a while–before he became a preschool dropout and started homeschooling 😉 –and they did this same dictating and then acting out of stories. It was a daily highlight at the school. The kids loved it! I never knew the source of this activity; I will look into Vivian Paley’s work. It’s such a fantastic way for younger kids to connect with writing in a way that’s meaningful to them, at their stage in life. I agree with all the points raised here. We cannot force children to write. But we certainly can lead them to the wonder of words and the tantalizing mystery of thinking that is inextricably related to writing itself. In my own classroom I’ve employed freewriting (see Peter Elbow on this: http://myweb.wvnet.edu/~jelkins/writeshop/writeshop/elbow.html) as a means to have students improve their writing and thinking. It certainly isn’t something I’d introduce to very young students as it requires a proficiency with the mechanics of writing, but I swear by it and by Elbow’s approach to writing (see for instance: http://works.bepress.com/peter_elbow/11/ ). No one learns how to become better at something simply by watching it or observing it. Sure, all good writers are good readers (though the converse is not always true), but to truly become a proficient writer who is capable of crafting meaningful, touching words we must swim in the element itself. Freewriting allows for this. In my classroom (7th and 8th grade humanities) I employ a mantra as an intro to and reminder of why we do freewriting. It is attributed to E.M. Forester: “How do I know what I think until I see what I say.” Sustained engagement with freewriting, in all its forms (pure, guided, focused, etc) enables students to employ writing in its most original and meaningful form: “Writing as discovery.” That is, freewriting allows us to anchor the abstract ephemera of “thinking” to the concrete world of the pen and page. In the process we are watching ourselves think, following our mind as it “lingers at the point of wonderment”, as one of my classmates at Bard College’s Institute for Writing and Thinking (http://www.bard.edu/iwt/ ) once called it. There are, of course, other purposes for writing. The one most of us are familiar with, because it is the one that is generally inflicted upon us by well-intentioned teachers (most of whom are generally not writers and who rarely know the process at the ground level) is “Writing to demonstrate learning.” As this is the most common form of writing practiced in school and on standardized tests, it’s no wonder so many of our practices tend to force this method upon students and we generally leave them mentally constipated, their pens and minds frozen by fear of being/thinking/writing something wrong. So while I agree with most of what I’ve read here, I’d urge more generally that writing become a practice. Writing is less an art–something which springs beautiful and whole from the minds of “writers” who are touched by and inhale the breath of the muse–and more of a craft–which employs a readily available raw material (words) which are then honed, shaped, retooled, carved, sculpted, and otherwise “worked and played with.” To say that, then is to note that writing…good writing…takes practice and time. All the suggestions here help to immerse them in an environment rich in that natural resource of language. Freewriting will allow them to write without judgment, to discover what they know, to hear how they think, and to find meaningful things to write about. It builds fluency, facility with language and offers students a chance to play with words and to think in ways that are utterly original. As well, it will help them find their voice more quickly than anything I know. And nothing is more empowering to a writer than recognizing where and when she found that voice…except, perhaps, the understanding that they even had a voice to begin with. Garreth, thank you for your thoughtful response. I absolutely agree with you that the more kids write, the better they will get at it. My hope in writing this article was to encourage parents to make writing an authentic activity in the lives of their kids. I felt compelled to mention the many older kids I’ve known who did not do much formal writing in their younger years, yet who developed into writers more easily than people might expect, because they had been raised in the sort of literate homes that I describe in the article. Still, I’m afraid the article downplays my belief that, yes, the more you write, the better you will get at it. Being a writer myself, I certainly understand this! The point I hoped to make is that kids will be likely to write more often if they have real, engaging reasons to write. I am a big fan of Elbow’s work, and freewriting, specifically. Freewriting is always what I do first when I set out to write something (I wrote about my process here: http://rhythmofthehomeblog.com/01/being-the-writing-process/ ) I’ve also encouraged my own kids to freewrite, and have used the technique with older kids in my writer’s workshops. You’re right: freewriting is a wonderful way to lead writers “to the wonder of words and the tantalizing mystery of thinking that is inextricably related to writing itself.” I love the Forester quote too; he’s one of my heroes! I appreciate being reminded about the power of freewriting. It’s a technique I should recommend more often to parents whose kids struggle to know *what* to write about, who can’t seem to find those authentic, engaging writing opportunities. If you don’t know what to write about, just write! And even if you know what you want to write about, freewriting can open up your thoughts on your topic in ways you never expected. Thank you for taking the time to share your experiences here with such detail and eloquence, Garreth! I’ve been thinking of you a lot lately, for two reasons–first, I remember you posting a while back about listening deeply when your kids talk about their passions, and how that listening helps them develop as communicators and eventually as writers. I’ve found that a helpful reminder when my son talks for a good hour about the different mobs on a Minecraft adventure map he’s found, or when my daughter wants to tell me a very long story that she’s making up as she goes along. Last week we had another of our writing group meetings. A lot of the kids like to write stories, but storywriting hadn’t really caught fire for my son, who’s 10 now. But the day after our last meeting, at which we talked a lot about what makes engaging characters, KA-BOOM! My son sat down to hand-write a “Minecraft drama-comedy.” After a while, he said his hand was starting to hurt, so I suggested he could write at the computer. I did notice that his punctuation and capitalization was rough and he didn’t break his chapters into paragraphs. I stayed mum and just focused on all the positives. I figure that if he eventually wants others to read this story, we can talk about making it easier to read by fixing up the punctuation and so on. I think a few years ago I would have wanted to jump in right away on those things. I’m so glad I’m more patient now. I think reading your blog and book have helped a lot. Thank you! I loved reading this, Carrie! I believe that this process can happen for all kids, if they grow up in an environment that nurtures it. Still, I never tire of hearing the real, specific stories of how it happens for real, specific kids. Every story reinforces my beliefs, and I’m so grateful to hear them. You have been so patient and supportive with regards to your son and writing, which I’ve learned through your comments here over the years. It’s gratifying to me to get to share your joy in the payoff! Isn’t it amazing how much kids can suddenly *do*, even if they haven’t practiced it? Because, of course, your son has been practicing writing for many years, even if it hasn’t always been with words transcribed. Good for you for not jumping on him about punctuation, capitalization, etc. You’re a writer; you know those are minor aspects of writing. You’re right: the opportunity will come when he wants to share his work with others, and there will be a real reason for him to make those fixes. Plus, he probably already understands what he needs to do intuitively, even if he isn’t doing it, because he’s a reader. Thanks for sharing, Carrie! I’m going to link your comment on the Facebook page for my website. Parents love reading these types of stories. They’re so reassuring. wonderful post! I wish the public school system would follow your suit. The writing these young kids are being asked to do is ridiculous. Thesis statement, followed by 3 points from the text to support the statement. They even created worksheets with boxes for them to write each point. My child is so wonderfully imaginative and creative. I am so afraid, he is going to lose this being forced to write in such a prescribed way. His drawings are complex and detailed. The stories he tells that go along with the pictures are incredible. I expressed my concerns with his teacher. Although, she did not come out and say it, I am certain she agrees with me. However, she is being forced to teach this way. Thanks for all the great ideas. Will be doing some major “unschooling” at home. There are certainly public school teachers who use a workshop approach, and don’t teach in such a prescribed way. However, it’s getting harder and harder for these teachers to continue teaching writing in this way; many are being forced into more formulaic, test-oriented approaches, as your son’s teacher seems to be. It’s so discouraging. I’m glad that you recognize all your son’s gifts as a writer and creator! Keep supporting that at home. Kids can become and develop as writers at home, especially if they’re given support and encouragement. You can help your son understand that this type of school writing is one kind of writing, but it isn’t the only kind! His stories are already bubbling up inside of him. You just need to help those flourish! Your take on writing really spoke to me. I feel like someone dashed a bucket of cold water over me. You have expressed for writing all my feelings about learning math! I always said I didn’t feel we had to wait for our child to learn to write numbers before starting math, so we did a lot of living math in our household. I came to the conclusion that math is a language, and that the point of language is about communication of ideas, it has to be meaningful, etc. And we created an environment that supported and celebrated that (yet I always assumed that it was because my child naturally loved math – I now think maybe it’s more that we didn’t kill his natural child’s interest in math). As a result, I have a child who talks and scribble math all day long, everywhere – any formal math we do is almost sort of irrelevant. But somehow, I didn’t do this for writing, and concentrated too much on the mechanics. I think I created an environment where writing lacks the same excitement. I think I am in danger of killing his natural child’s interest in communicating with words. Thank you for opening my eyes! What you write about math is interesting to me. Math and writing are the two school subjects that often fill homeschooling parents with worry, because we’ve become convinced that they need to be learned in a linear, circumscribed way–but they don’t! It’s easy for me to see that with writing because I’m a writer myself. It was always a little harder for me with math, but then I saw an unschooling parent who also teaches college-level math speak at a homeschooling conference, and she helped me see how kids can learn math in a similar way. Your insight that one of the essential things you’ve done is not killed your son’s interest in math makes sense to me. Kids have such good instincts and capacity to learn; when they grow up in a supportive, engaging environment and we don’t get in their way, their learning seems limitless! I know it may be frustrating to feel that you’ve gone about writing with your son in the wrong way, but it’s never too late. I pushed my oldest too hard with writing, but he forced me to come to my senses and we shifted things and he came to love writing. You already have a wonderful model for how your son has learned math; just try applying that to writing! He may not be as inclined to writing as he is to math; the best thing you can probably do is stop yourself if you find that you’re doing something that might undermine his natural interests. Push less, have patience, and I’m sure you and he will find your way. You know, I don’t actually feel frustrated, I feel excited! I mean, isn’t it great I found this NOW rather than 2 years down the road? I really hope you are still writing your book (or that it already exists – sorry, I haven’t gone through ALL the archives yet) because, you have an important method to share. I read a few books on helping children write, but I never felt so clearly as with your blog that you are really trying to see the process from the user end – the p.o.v. of the child. I can then use that as a framework to think about it from my own child’s perspective, based on what I know about how his mind works. What you write also makes me reflect on things that have happened in the past which are basically missed opportunities, but that too is very useful because the next time something like that crops up, I’ll recognise it. Re math: I was one of those homeschooling parents that worried about math, because it wasn’t my forte. I read everything I could get my hands on – how the Russians did it, how mathematicians thought (in their own words), biographies, etc. I was less interested in curriculum than I was of the mental processes behind mathematical thinking. In the end though, I was most guided by my child’s developmental stage – he couldn’t write, so it was either nothing, or I would just make do with where he was. I guess that’s why what you say instantly hit a chord with me. You are saying, don’t let the arduous physical act of writing be a hindrance to the creative impulses of writing. I buy that 100%. I now realise that just as I accepted that it was my job to chat to my child about math (because he couldn’t write it), I now accept that it is my job to take dictation from my child (because it is so arduous for him to write it). It is akin to holding a child’s hand till he can walk by himself and then, after that, still hold his hand if he wants to. And you are right, it is such a time and labour (and love!) intensive process that it is not really feasible in schools, but we homeschoolers have the luxury of pursuing this method. Your comment actually made me teary-eyed. There is nothing as rewarding to a writer as feeling that she has connected with a reader, and conveyed something she cares deeply about. I appreciate your insight that I am trying to consider the writing process from the child’s point of view; I’ve never really boiled my ideas down into that simple statement, but you’re right! That’s exactly where I’m coming from. My notions about writing come very much from more than 20 years of trying to teach myself to write as an adult, so I consider the process from the perspective of that struggling writer–not a teacher. Writing is the one area in which I’ve felt that I could really identify with my kids’ struggles, because I knew them myself, even if my struggles were slightly different from theirs. It’s encouraging to hear your feedback because no, I have not written the “big book” on writing that I’ve been working at for several years now. In the past several months I’ve been trying to figure out what to do next: try to get a book proposal together; just keep writing here on my blog and try to better develop my ideas build an audience first; put the writing book on hold on write a collection of essays on homeschooling… It’s hard to decide what to focus on! Feedback like yours encourages me that maybe the writing book is needed, and it’s what I’m called to do. Thank you for taking the time to offer your enthusiasm and encouragement. It means a lot. Least I can do is show appreciation for the gift you have given to me – and the community! Maths. (I’ll try and say math.) What Cy said reminded me of something. I was recently at a fabulous unschooling conference, and one of the talks was about math, by a Dad who has a very impressive higher math degree, from Cambridge. He was offering reassurance, from his own experience, that kids will get it. That math is all around, and that unschooling will work just fine, go ahead and relax. And Sandra Dodd was there, too, with a similar story about her daughter at age 14 or something, deciding to take a college math class her dad was teaching, all very successful, happy ending. Great, really. What I think we could all use, Patricia, (and I’m saying this from a perspective of having no idea whether you’re a houseful of maths whizzes- if so, you’d best ignore me,) is for someone who has successfully, um, unschooled (? ?- well, just not “taught,”) math to kids who are now math-functional adults. Someone without a math brainiac in their house and in their veins. I love that we’re going to talk about “maths” on a post about writing, wanderingsue! We’ve tended to approach math the way we do most of our homeschooling: we choose an area of focus, and I gather up as many resources as I can find and have the kids figure out what looks interesting. They usually tire of a single approach fairly quickly, so we use lots of resources, geared to their interests. For example, somehow Mr T and I have not dug into geometry much. (I don’t know why that is; it was always a favorite of my oldest!) So, he will be trying out activities with Geometer’s Sketchpad https://www.keycurriculum.com/products/sketchpad , which I think T will enjoy because he likes working on the computer so much. We will probably also look at the fantastic website Yummy Math http://www.yummymath.com to see if there are geometry activities that intrigue T. And I’ll pull out all the other resources I’ve been gathering over many years of homeschooling and see what appeals to him. Both of my older two were thrilled to be *finished* with math by the end of high school–but you should hear how well my oldest can mentally compute the ratios necessary to choose the right camera lenses based on distance, light, aperture, etc! So no, wanderingsue, no one around here is a math whiz–although my husband is a finance guy who does all sorts of maneuvers with numbers on a regular basis. Nevertheless, I think real-world math can be fascinating, and I’ve done my best to help my kids see it that way too. I know you’ve said before about not being unschoolers, but I’ve always thought you seem to share a lot of the unschooling philosophy, at least as far as literacy goes. The way you describe your chosen “area of focus,”- do you do that with writing/literacy things, too? Or do those come more organically, because you’re writing so much yourself, and appreciating good writing, and discussing it? (I am quite conscious of trying occasionally to point out things I particularly like in the books we share, for example, but it does NOT come naturally. Yet.) There’s that whole genes/love double argument again, where you feel like don’t have to worry so much about what your home life is just naturally going to be rich in. But it seemed like Cy did the opposite. She wasn’t so comfortable with math and it sounds like she’s acing it! I’m from a family of math nerds, and that’s part of why I love your whole blog so much- because writing is where I’m afraid I’ll fall down, so I’m trying to do the same kind of research that she did, only in literacy. And feeling fairly comfortable about it so far. So, thanks for that. Wanderingsue, when I say that the kids had an “area of focus,” that focus tended to zero in on a historical topic, or a scientific one. Although that’s not always true–Mr. T is currently spending a lot of his time designing a very elaborate role-playing game, and that doesn’t fit into history or science. Likewise, in math we might focus on geometry for a while, or probability, or fractions…That’s just how it tended to work out for us. It’s easier to gather a variety of resources if you zero in on a particular topic. It’s hard to describe a typical day, because what is typical? But most days when the kids were young included a good amount of reading aloud, and some kind of making or drawing. I would help the kids come up with projects; sometimes those would last a day, and sometimes they would go on for weeks. We never tried to explore every typical school subject in a day (that would be nuts for us!) More likely, it seemed that we might do about three different types of activities in our time together–anything more than that felt forced and rushed. And, of course, before our “homeschooling” time and during it and afterwards, there was lots of play and self-directed learning. Of course, every family will discover their own habits and flow. Is that helpful, wanderingsue? It’s hard to summarize so much of what we did/do in a short space. If you want me to elaborate more, please ask! I appreciated the comments from Linda, June 9 and 10, 2012, about not everyone needing to learn to be a novelist. And then in your reply to me on Aug 21, 2013, Patricia, you had a little vent about schools requiring way more maths than most kids are going to need, and putting most people off maths along the way. I totally agree. But, I agree the same principle in every subject, I think. Including writing. (Ooooh, I hope them’s not fightin’ words- they’re not meant to be!) I was among the many who hated English class, first in Massachusetts, learning boring old grammar for a thousand years, and then in Australia where I was just wrong- wrong opinions, (I defended Stephen King as a good novelist. I was 15.) wrong vocab, wrong accent, wrong, wrong, wrong! Anyway, I agree that everyone should ideally be able to express themselves clearly on paper or screen, in the same way everyone should be able to tell if second-hand car financing is ripping them off, or whatever. And I think a big part of your brilliance is in recognising that traditional education is killing that. And I guess the logical next step is, well, we’re a society, people specialise (sorry, -ize) and if someone isn’t comfortable understanding the car finance on offer, they bring a friend. If someone wanted to write a letter of complaint, (an example about Styrofoam cups, someone else gave, above,) they could consult a friend, too. As most of us do for lots of written things such as job applications, I think. And seeing as how it’s Oct 2013, can I just draw you back to this whole post and conversation? I know you enjoyed it at this point, love, and please remember that all this wisdom is out there forever, now- it’s not only about the blog community of today. Plenty of us will find you later, and appreciate you ever so much. Thanks, as always! No, those aren’t fighting words, wanderingsue. 🙂 I certainly don’t think kids need the sort of writing instruction that you were given. Any 15-year-old who wants to defend Steven King as a good novelist should be encouraged to–that’s the sort of writing that would be fun and useful! If kids were allowed to express the thoughts that matter to them, clearly and with evidence, in writing as well as verbally, they would pick up some important skills and feel like their ideas mattered. Thank you–as always!–for your never-failing encouragement, Sue. If deaf musicians can create beautiful music for the world to enjoy while never ‘hearing’ it themselves surely great writers can come from those who are delayed with pen in hand. Lol. My homeschooling 9 and 11 year old girls take up their pen with grumbles but never ever grumble to create original dramas they act out, share intricate stories they devise, sing original songs based on silliness and life, cartoon summaries of all varieties, and the like. Their ability to communicate is evidence of their thinking and writing skills – the very foundation and testimony. In a world filled with so many schools of thought and such rich history one needs only to look around at the written word to see that rich writers needn’t all go through the ABC’s of writers 101 — at least until (or perhaps unless) they seek to be further equipped. Please excuse my belated response; we were traveling. I love hearing about your daughters’ rich experiences with language. They’re lucky to have a mother who recognizes the wonder and learning in all they do! Thanks for taking the time to say hello! This is so encouraging. My kids have taken to writing stories about fictious families they keep making up. My now 13 year old started the Dolltown Chronicles newsletter with stories of their dolls, complete with recipes, ads, etc. My son, 11 helps with the newsletter. Oh gosh, Jennifer, that’s fabulous. The projects they come up with on their own teach them so much more than anything we might conjure up for them. And often we as parents don’t see that, unless we really pay attention to what they’re doing. Also, the Dolltown Chronicles sounds like something they’ll never forget. Childhood encapsulated. Reading this experience confirms a lot of what I have seen with my son. He is a keen conversationalist, long may it last. The school however are concerned about his constant need to speak and his lack of passion for reading school material. We live in a household where, my husband mainly, enjoys a discussion, and We value my sons point of view. We will continue to encourage our sons way of communicating with the world. P.S. I’d love to know how you found my blog. There was a ton of action from Facebook this weekend, but I don’t know where it specifically came from. What a great post, my children are all home educated and I often worry that they will grow up not being able to read or write despite my eldest only being 8 years old. I have seen my children progress over the last year in both reading and writing in a natural way, but they are still “behind” their schooled peers. This has been a reassuring and encouraging post to read, thank you. Hi Tanya! I think one of the best things to keep in mind when you homeschool is this: try to let go of what school kids are doing, and pay close attention to what your children are actually doing. Keep noting the progress that you already see! Pay attention to the fantastic things they do that have nothing to do with schools and their values. Homeschooled kids can develop in such wonderful ways–it’s us parents who often have to shift our perspectives to see it. I’m glad my post was helpful!